St. Mary’s Church building looks radiant in her new black slate and copper. The black Spanish slate from Cupa Pizarras is an excellent replacement for black Pennsylvania slate that you don’t see much anymore, hard and uniform, cuts clean. That must have come in very handy on the St. Mary’s job, on the conical shape at the back of the building, called the apse, at least when you are inside it. There is a lot of slate to cut for a conical shape. Think of it – – The bottom row of slate has exactly the same number of slates as the row at the top, just the slates in the top row are cut considerably narrower. And all are cut at an angle, both sides, so the ones from the top row look like a pile of Neolithic spear points, complete with the sharp chipped edge, and holes punched. St. Mary’s is a beautiful, compact Romanesque building. The new slate replaced asphalt shingles, not the original slate. We learned that from Google street maps, as it still shows the asphalt. Who knows what it was originally, maybe the Pennsylvania slate. The roof design is very knowing, check out the full copper roof below the main valley. They knew slate wouldn’t survive at that location. And check out the size of the main roof gutters, very high capacity to accommodate the concentrated flow out of the valley. As Google maps shows, again, this was the original design for the gutters, so the original builders got it right. List of Church Restoration Specialists. Note: Most slate from Europe comes from Spain. Read more on slate as a roofing material here. 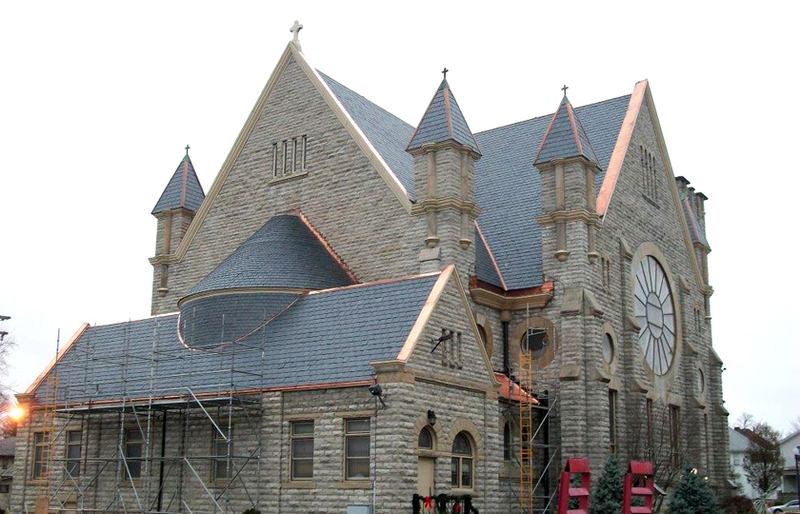 This entry was posted in Roof Restoration and tagged Church Restoration, Ohio, Roofing Slate and Tile. Bookmark the permalink.